Nov. 3 San Francisco Kansas City, Kan. Columbus, Ohio;Indianapolis Washington, D.C.
Nov. 10 Salt Lake City Tulsa, Okla. Nashville, Tenn. Raleigh, N.C.
Dec. 1 Phoenix Dallas Baton Rouge, La. Orlando, Fla.
Dec. 8 Riverside, Calif. Austin, Texas New Orleans Tampa, Fla. In its first days of the media preview of theÂ 2014 North American International Auto Show, Detroit has lots to see. Taking place as always in Cobo Hall Convention Center, the Detroit Auto Show has some $200 million in displays for 2014. Over 5,000 journalists stormed the doors of the revamped Cobo, with over 700 vehicles, 50 new debuts and more than $279 million in renovations, including new conference rooms, a glass atrium and food court. The 50-some year-old convention center saw 796,000 attend the world famous North American International Auto Show in 2013. The theme of the 2014 NAIAS show is “we’re alive again. The show opens to the public January 18-26. A car for the 21st century, the Dune Concept: Yet, another version of the beloved Beetle, with a ski rack built into the roof and rear spoilers, based on the Beetle R-Line with an EA888 TSI engine with 210-horsepower, the Dune is wider and taller and adds two inches of ground clearance.Â Combined with a six-speed DSGÂ® dual-clutch automatic transmission, the Beetle Dune has a manufacturer estimated fuel economy rating of 23 mpg in the city and 29 mpg on the highway. 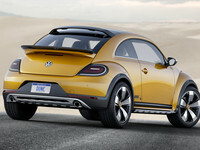 Regardless of where it shows up, the infamous VW Beetle is a hit, bringing a smile to people’s faces.Â With the world premiere of the Beetle Dune at the North American International Auto Show in Detroit, Volkswagen is giving the public the chance to see a Beetle with a cool offroad look. The Dune concept shows the potential for a new production version of the sportiest Beetle ever. The concept is painted in â€œArizonaâ€, a yellow-orange metallic, with two-part wheelarch extensions that are offset in black. Like the Cross Golf, these extensions are rugged looking elements with a matte finish. The wheel housings widen the body by 1.1 inches per side to give a total width of 73.4 inches, an increase of 2.2 inches over a stock Beetle.Â The overall length has increased by 0.5 inches to 168.9 inches and the car is both 2.0 inches higher off the ground and 0.8 inches taller. The Dune’sÂ front and rear tracks are increased by 1.1 inches at the front and rear to 63.3 and 61.9 inches respectively. As a result of the four-square stance and its reduced wheel travel, the 19-inch wheels and 255/45 tires fill out the wheel housings.Â At the center of each wheel is theÂ VW logoÂ embedded in a three-dimensional housing thatâ€™s painted in the carâ€™s exterior color. The distinctive Dune logo is placedÂ in front of the rear fenders. The front end sports the Beetle’s basic design and Bi-Xenon round headlights, however a new hood has been adopted, which has a raised center section with prominent air vents, which have a honeycomb appearance with a central chrome strip. The front apron features a large central air intake. The intake widens towards its bottom edge, highlighting the front endâ€™s sporty look: the black honeycomb screen has a chrome-plated surround that morphs into the underbody protection. To the left and right of the central air intake and the aluminum underbody protection are the foglight housings: trapezoidal in shape, they have gloss black frames and contain LED foglights. The skis are mounted to the outside of the trunk lid which is made possible byÂ the swiveling of the outer parts of the rear spoiler. The skis are placed in the spoiler, then it is closed to clamp them in place. At the top, the skis slide into a receptacle in the specially developed roof spoiler, where they are secured by an 0.8-inch-wide belt. The Dune’s interior hasÂ also been revamped: The dashpadâ€”painted in the â€œArizonaâ€ exterior color and has been replaced by another classic original Beetle feature, a grab handle that features contrasting black soft-touch material with â€œArizonaâ€ and aluminum accent. In addition,Â the entire infotainment system incorporates a digital interface with a high-resolution 7.7-inch touchscreen. The seat design is sophisticated and sporty, andÂ upholstered in â€œTitan Blackâ€ leather, while the center surfaces are made of â€œCeramiqueâ€ colored â€œGobiâ€ breathable sport fabric. The leather and fabric areas and the front and rear of the head restraints have decorative stitching in the â€œArizonaâ€ color. VW’s new Golf R also makes its debut at NAIAS and will offer a race-driving mode which sharpens the throttle response and shift points, while firming the shocks. VW E-Golf is also featured at NAIAS, with its everyday versatility with zero tailpipe emissions, low ownership costs. Lexus makes three debuts at NAIAS, including on center stage, their global premier of the RC-F ‘low-slung, athletic’ coupe,Â withÂ Toyota’s most powerful V8 performance car ever developed by Lexus. Also on display are the RC 350 and LF-NX turbo concept cars, making their North American introductions, having first debuted at the Tokyo Motor Show. The RC 350 features a 3.5-liter, V6 engine teamed with an 8-speed sequential transmission, and the most aggressive styling yet of its iconic spindly grille. The LF-NX turbo concept, a premier compact crossover SUV, is bold, dynamic and innovative in its design. The Lexus exhibit also shows off the F Sport accessorized vehicle and components, including the LFA performance car. Lexus celebrates 25 years in Detroit. With 35,000 square feet of exhibit space, Toyota features 38 vehicles, including the 2014 editions of the new Corolla, Highlander, 4Runner and Tundra. Highlights for the media include the FCV-fuel cell-powered concept. Also on display is the unique concept Toyota FV2, future mobility car operated by the driver shifting his/her body to intuitively move the vehicle in any direction. Toyota is also featuring its hybrid technology with all four Prius vehicles. And for NASCAR fans, Toyota offers its Racing Zone. But the big shock of the show is the FT-1 concept, a midsize sports coupe. In collaboration with BMW, the FT-1 will head Toyota in a new direction with innovative exterior design. Brings back shades of other legendary sports cars like Supra, the 2000G, Celica and MR2. Appealing to youth-oriented markets, Scion has 10 vehicles on display, including the 2014 limited edition Monogram Series FR-S and tC models. Also focusing largely on social media elements, such as their “Master Dashboard” video wall which displays live Scion tweets, Facebook posts and Instagram images, Scion introduces the “Scion Swag Machine,” the world’s first Instagram-powered near-field communication enabled vending machine. Also available at the Scion exhibit is the availability of “Paper Shapers” Scion cars. Created by artist Shin Tanaka, guests can assemble their own Origami style cars. Ford introduces the 2015 F-150 with its 2.7-liter engine. Other introductions at this year’s Detroit show include the 2014 BMW Z-Series Coupe, 2015 BMW M3, 2015 BMW M4 and the 2015 BMW Z4 Pure Fusion Design. Cadillac will show off its attractive 2015 ATS Coupe; Hyundai its Genesis sedan. Audi introduces its 2015 A8, and of course, the all-new sports car of the year, Chevrolet Corvette, introducing the Z06 this week. Other intros include the 2015 Mercedes-Benz C-Class, 2015 MB S600 and the GLA 45 AMG, 2014 Dodge Dart SXT Blacktop, 2015 GMC Canyon, 2015 Honda Fit and the all-new Infiniti Q50 Eau Rouge concept, Mini John Cooper Works Concept, Nissan Sport sedan concept, 2014 Porsche 911 Targa, 2015 Blue Motion Concept, Volvo Concept XC Coupe and 2015 Subaru WRX STI. March 19, 2012. Ladies..Start your Engines! Join womenwithwheels.com for the Inaugural Girls Go Racing: The Art of Driving Adventure event at Road America Race Track in Elkhart Lake, WI. Presented by Womenwithwheels.com, this event for women will take place May 5-6, 2012. The driving event will be on Saturday May 5, from 9-4.
â€œFor years women have been encouraging me to organize a â€˜ladies dayâ€™ at an auto race track. A spirited day of learning vehicle dynamics, improving on driving skills and pushing their limits in a race car,â€ says Susan Frissell, publisher and editor of Womenwithwheels.com and the gal behind the wheel of Girls Go Racing: The Art of Driving Adventure. According to Frissell, Women With Wheels has finally turned a dream into reality and coordinated a day of driving they guarantee will be far too much fun for all involved. On a controlled driving course, participants will receive the fundamentals of driving, as well as useful everyday maneuvers. Included in the full day at the race track are classroom discussion, in-car lessons which will include vehicle dynamics, and an on-track portion. Monitored and led by professional driving coaches, the Girls Go Racing event will be the perfect introduction into the exciting world of auto racing. The reasons for joining us at Girls Go Racing: The Art of Driving Adventure are as varied as the cars you drive. Maybe you have always wondered what it feels like to experience pulse-pounding exhilaration at top speed. Or perhaps youâ€™re crossing yet another â€œwishâ€ off your bucket list. Some will no doubt be fueling their passion for motorsports. Or taking on a dare! Of course you must join us for the first annual Girls Go Racing event at Road America. You wonâ€™t want to miss being a part of this enthusiastic group of gals who believe in going for it. All women age 18 and up, with a valid driverâ€™s license are welcome to attend. For more information, itinerary and pricing, contact Susan Frissell or Donna Luteri at girlsgoracing@gmail.com. LADIES…EMAIL US FOR YOU REGISTRATION. COSTS WILL BE $149 FOR A FULL DAY AT THE TRACK, LUNCH, SMALL BREAKFAST AND MEET/GREET ON FRIDAY MAY 4. JOIN US FOR A MEMORABLE EVENT!! 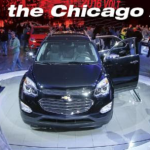 2012 Chicago Auto Show – February 11-20.